If it has avocado, I love it. What is it about this ugly on the outside, green and slimy on the inside fruit that is so amazing? How about I eat another one and then tell you? I love guacamole and no matter how many times I hear avocados are the “healthy fat,” it still doesn’t make it okay to eat a whole bowl. Unless, it’s my entire meal, of course! I stumbled on this recipe and knew it would be delicious and potentially healthier because of the addition of garbanzo beans (a.k.a. chickpeas). I love hummus and I love guacamole. Combine the two? Sounds good to me! 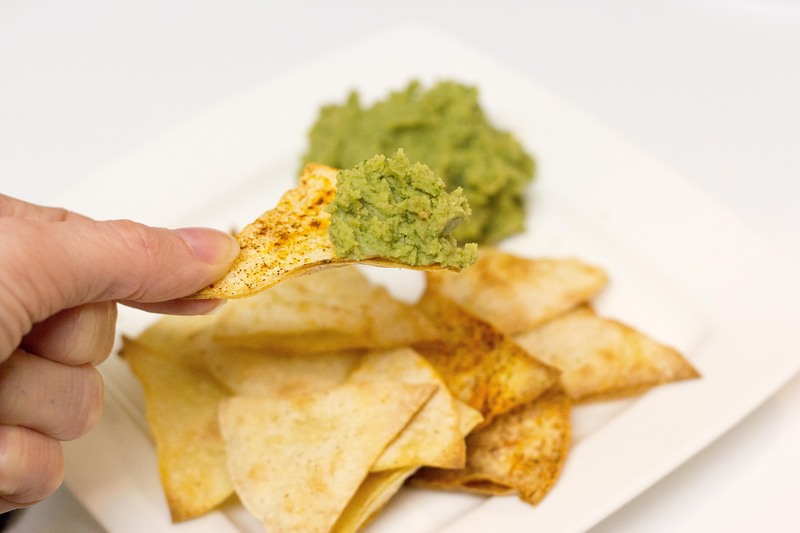 You know what goes perfectly with Guacamole Hummus? 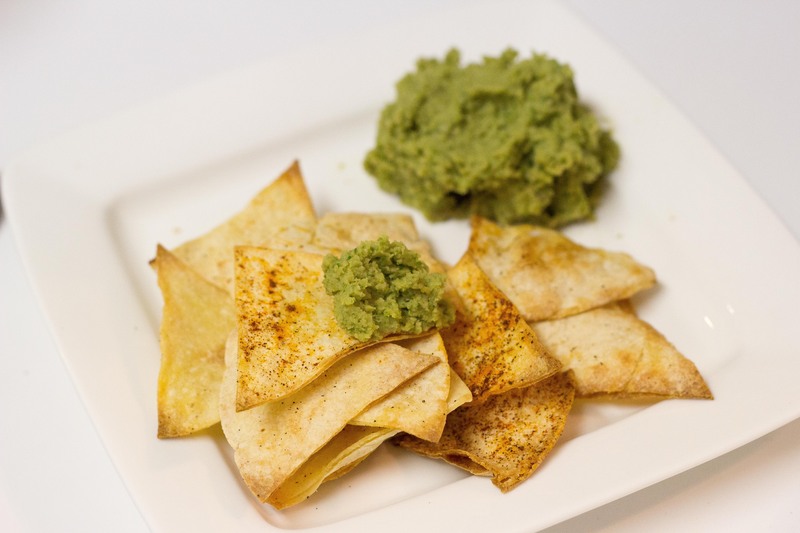 Homemade Hint of Lime Tortilla Chips. Recipe coming soon! In food processor, combine avocado, chickpeas, cilantro and garlic. Process until finely chopped. With food processor running, slowly add olive oil and lime juice. Add water 1 Tbls at a time until very smooth. I ended up adding about 3 Tbls of water. It seemed to make the consistency the smoothest. It definitely did not water down the flavor. I’ve been eyeing a recipe that has LOTS of mushrooms on top of creamy polenta. I didn’t have any uncooked, plain polenta but I did have a package of pre-cooked Trader Joe’s Organic Polenta that we usually use for polenta fries. Soooo, I did a little thinking and came up with this…. 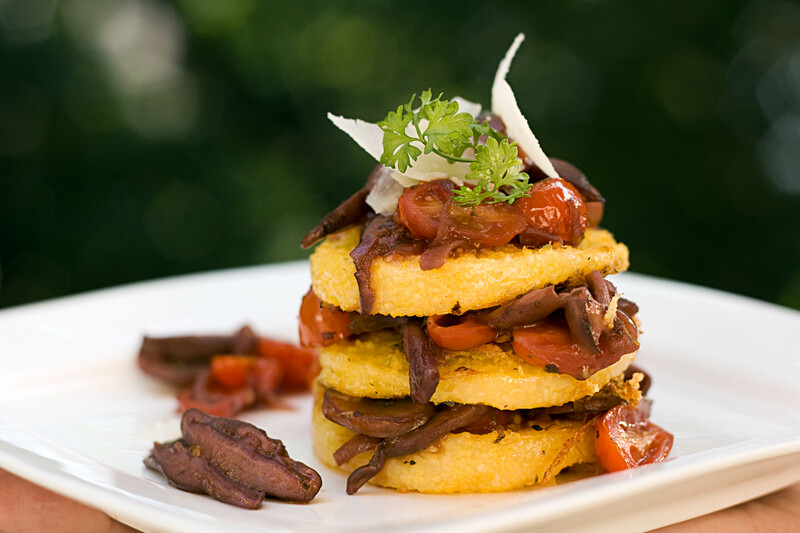 Stacked golden polenta rounds with mushrooms and shallots sauteed in a wine reduction. Topped with shaved Parmesan. Glass (or bottle) of wine. Friday night deliciousness. Did I mention, it’s actually healthy? Please ignore Andy’s hand in the picture. We have absolutely NO natural light coming into our place so he’s holding it over the balcony. My Photoshop skills are lacking, so the hand stays. Heat olive oil in pan over medium heat. Add the shallots and balsamic vinegar. Cook for 2 minutes. Add tomato paste and mushrooms. Cook for 5 minutes, stirring occasionally. Add wine and Italian seasoning to pan and simmer for 5 minutes. Add grape tomatoes and cook for 5 more minutes. Transfer mushroom and shallot mixture to small pan. Spray large pan with olive oil spray. Add polenta rounds. Cook for 4-5 minutes each side, until golden and crispy. Place one round on a plate then top with a spoonful of mushroom mixture. Sprinkle with cheese. Repeat layers two more times for each Napoleon. *I served this with lemon and herb marinated chicken breast and broiled asparagus. Inspired by Wild Mushroom and Tomato Ragout with Polenta from Shape Magazine.